Located on a picture-perfect, white-sand beach just a short walk from the Atlantis Casino, the Riu Palace Paradise Island is a true oasis of fun and excitement with a distinct Bahamian flair. Featuring the All-Inclusive by RIU concept, this breathtaking resort offers unmatched service, world-class activities, nightly entertainment, and a resort complete with a picturesque swimming pool, gourmet restaurants, inspiring ocean views, and one of the most beautiful full-service spas imaginable. All guestrooms are equipped with a fully stocked mini-bar and liquor dispenser, Free WiFi, and satellite TV. À la carte dining choices include Grill Steakhouse, Fusion, Japanese, and Italian. Room service is available 24-hours a day, perfect for those late night cravings! Activities and entertainment are in full swing at Riu Palace Paradise Island. Enjoy a day on the beach playing volleyball, or work up a sweat in the full-service gym. Shows and live music are available several nights a week. Children can enjoy their very own swimming pool. There is something for everyone at Riu Palace Paradise Island! Enjoy the tropical atmosphere of the large, free-form swimming pool with waterfalls, two whirlpools, and a swim-up bar to keep you relaxed and cool throughout the day. With elegantly appointed accommodations and a la carte dining options, you'll feel a sense of sophisticated luxury that goes far beyond your expectations. This magnificent resort is close to many tourist attractions and just steps away from the best entertainment, lounges, discos, and shopping areas the island has to offer. The program of sports and leisure activities includes tennis on two floodlit courts, beach volleyball, water polo, aqua aerobics, diving demonstration lessons, snorkeling (equipment available), and more. The Be Live Collection Punta Cana is an exclusive all-inclusive hotel resort in Punta Cana that has been especially designed for those who wish to spend their holidays with their family, get away from it all with their partner, or enjoy a holiday among friends with an authentic touch of the Caribbean. 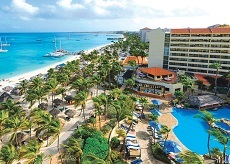 This casual, beachfront resort offers a gracious blend of Caribbean hospitality and personalized service. Great for relaxing tropical getaways, guests are treated to a wide variety of complimentary water sports and a Discover Scuba lesson. Experience fun-packed days and romantic nights in the relaxed, informal atmosphere and tasteful guestrooms boasting a beachfront location with water views and a balcony. 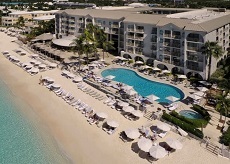 Encounter endless summers at Grand Cayman Marriott Beach. 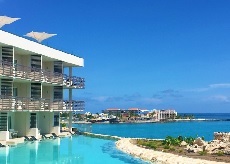 Our resort positions you on the gorgeous oceanfront of the Seven Mile Beach. Soak in the sun as you snorkel, swim and paddleboard on the crystal clear waters just steps from our doors. You can also catch mesmerizing views of the Cayman Islands from our outdoor pool, overlooking the serene waves. Pamper yourself in style at our spa offering rejuvenating facials and massages. When you're ready to settle down, our accommodations will make you feel right at home with plush bedding, LCD TVs and room service for your utmost convenience. Many of our spacious rooms also feature private balconies with inspiring beach views. Worked up an appetite? Satisfy your hunger at one of our four restaurants and bars serving international cuisine and cocktails. Make the most out of your stay by hosting a meeting or social gathering in one of our three event venues. Whatever adventure you choose, savor an unforgettable experience at Grand Cayman Marriott Beach. Right on the shore of Bavaro Beach, where the Caribbean Sea meets the Atlantic Ocean, we find our Grand Palladium Punta Cana Resort & Spa. Thanks to this idyllic setting, you'll enjoy your vacations under the warm Caribbean sun walking along a one kilometer long beach with fine white sand. The waves of a transparent turquoise sea sing a soothing lullaby in the midst of lush tropical vegetation. Whether you travel as a couple or with your family, you can choose from a wide variety of cuisines, pamper yourself with relaxing massages in the Spa or practice your favorite water sport. The facilities and services you'll find at any of our Palladium Hotels & Resorts will make your stay an unforgettable experience. 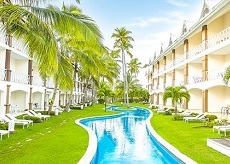 Nickelodeo Hotels & Resorts Punta Cana is a five-star experiential resort designed to provide guests of all ages an incomparable luxury vacation filled with playful surprises. Located on the golden sands of Uvero Alto beach, 60 kilometers north of Punta Cana Airport, this Resort provides both nonstop family entertainment and the renowned Gourmet Inclusive Experience by Karisma. The result is an unforgettable getaway for Nickelodeon Fans of all ages. This beachfront resort features 208 suites designed to cater to a variety of travel experiences, from intimate Pads and Flats to Swim-Up Suites. Guests may also choose to book one of four exclusive Super Villas including the Pineapple, inspired by SpongeBob Square Pants' own home. All suites feature indulgences like free standing tub, private patios, wrap-around terraces or balconies, and 24-hour in-room dining options. The Resort offers innovative cuisine, impeccable service, stylish, playful decor, unique amenities and around-the-clock entertainment to all of its guests. At the heart of the resort is Nickelodeon Place, including the Aqua Nick Water Park, Character Central, and Just Kiddin' kids' club. 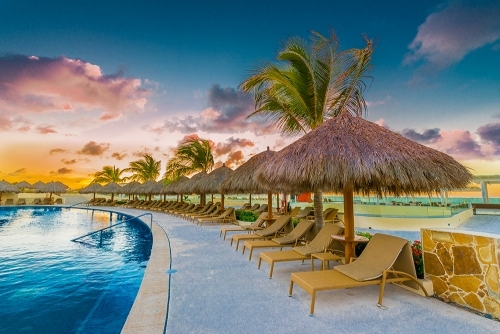 Guests also have access to 7 Gourmet Inclusive Restaurants, 2 Gourmet Corners and 2 Inclusive bars and lounges within the resort and Gourmet Inclusive Village, shared with neighboring Sensatori Resort Punta Cana. Live it up at Sonesta Maho Beach Resort, Casino & Spa, where you'll have the beach, on-site restaurants, shopping and a casino at your luxury. Located on the island of St. Maarten, this all-inclusive resort offers a variety of activities for the whole family to enjoy. From pool games to beach volleyball to tennis and more, this Caribbean getaway gives you lots of variety without breaking the bank. And, the Sonesta Maho sits right at the edge of the airport, so soon after your plane lands, you'll be at your resort and on the beach relaxing. Plus, you can watch the planes soar by. At Sonesta Maho Beach Resort & Casino, you'll have ten acres of gorgeous St. Maarten beachfront. You can relax on a lounger while the kids ride the waves on boogie boards, or join in for some snorkeling in the crystal-clear water. Head on up to the pool where you can catch some rays on a lounger at one of the resort's two swimming pools, where activities, games and fun are going on throughout the day. The waterfall keeps the kids busy while grown-ups swim up to the bar for daiquiris. Make sure to swim up an appetite for shrimp linguini at The Point, or grab classic burgers and fries at Palms Grill. The glamorous Showroom at Casino Royale features spectacular after-dinner entertainment. Plus, you can test your luck at the casino tables. Sonesta Maho Beach Resort, Casino & Spa feels like a village with five restaurants and bars, a full-service spa and a promenade lined with shops. From the convention center to the Vegas-style Casino Royale, the resort's amenities satisfy even the choosiest clients.